“Vis Invisibilis” (Invisible Power). Motto of the Hexahedron’s Clandestine Action Team. If there is anyone in the Intelligence scene who is deserving of their code-name it is the Locusts, as damaging as the insect for which they are named. For once, the analysts of Yănjīng, Yu Jing Military intelligence, were very accurate when they christened them with this code-name while performing their operational evaluation. Previously, the Locusts didn’t really have a name. It wasn’t really needed as there was no record of their existence. 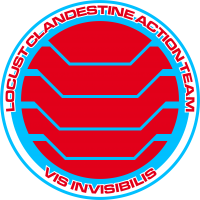 The Locusts are field agents of the External Reconnaissance Agency, a division of the Hexahedron. This agency is known as the “Big Nothing” because it is so secret that its very existence is classified. The mission of the Big Nothing is HUMINT, the data obtained from people, and the conduct of info-espionage outside of PanOceanian territory. And that is the task of the Locusts, among other even more clandestine and illegal things, the majority of which are related to the lethal use of weapons. Because the Locusts are a part of the dark forces which help PanOceania remain the number one power in the Sphere. A presence in the shadows that is always there, keeping the free world running with methods that, if the general public knew of, would be considered questionable and immoral. You already know: espionage, theft, sabotage, assassination...the four aces of the intelligence underworld. Extract from the report of Carlos Hornoy, technician-analyst of Midnight Sun, specialized Nomad intelligence analysis group.